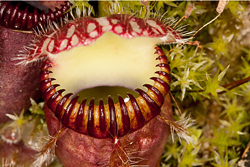 Carnivorous or insectivorous plants lure insects into death traps then gorge on their flesh. Is that any way for a plant to behave? It is this macabre aspect of their lives that attracts people to them in the first place. They are in fact specially adapted plants which derive some or most of their nutrients from trapping and consuming animals, typically small insects and other bugs. They grow in places where the soil is thin or poor in nutrients, especially nitrogen, such as acidic bogs and rock outcroppings. Their “trapping” mechanisms are very varied as are the approaches they use to attract food. Some are active i.e. they move to catch and ensnare prey but most are passive. The most well-known is probably the Venus Fly Trap which is definitely an active species trapping its prey behind “bars”. 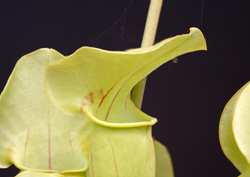 Others such as the Pitcher Plant rely on insects falling into a pitcher shaped growth and still others use sticky leaves or tentacles to trap the prey. To really appreciate these small delicate plants you have to get very close and thus they are ideal subjects for macro work. Most of these photos were taken at a private carnivorous plant nursery in Suffolk where I run specialist macro workshops to allow you to take your own photos and with the help of Andy the owner; to learn more about these fascinating plants, their unique adaptions and the conditions in which they grow. All visitors to these workshops come away with excellent photos, a greater knowledge and understanding of these plants and often a specimen to enable them to continue their photography and enjoyment of carnivorous plants at home. To learn more or book a place on this special workshop click here. 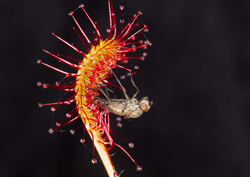 These photos are organised in the main groupings of carnivorous plants. Please click on each thumbnail to link to the gallery of photos. I fully intend to add more photos as I extend my knowledge of the subject. If you are interested in these special plants revisit this section regularly. 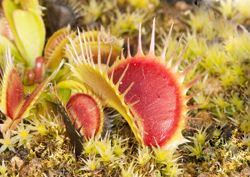 This is the best known of the carnivorous plants and is native to the bogs and swamplands of North and South Carolina. It uses the uniquely shaped terminal portion of its leaves to catch insects. The trapping mechanism is composed of two lobes with hinged together by a midrib. Each trap has "trigger" hairs on each lobe which trigger the trap mechanism. Once trapped the insect is digested by strong degradative enzymes. This is a slow proces which can take up to 10 days. The sundews are the largest genus of carnivorous plants, with at least 194 species worldwide. They all lure, capture, and digest insects using stalked mucus covered tentacles covering their leaf surface. Both the botanical name which derives from the Greek δρόσος: "drosos" = "dew, dewdrops" and the English name sundew or "dew of the sun" refer to the glistening drops of mucilage at the tip of each tentacle that resemble drops of morning dew. The Sarracenia genus consists of 8 to 11 species of North American pitcher plants. The plant's leaves have evolved into a funnel in order to trap insects. The insects are attracted by a nectar-like secretion on the lip of funnel or pitcher, as well as a combination of color and scent. Slippery footing at the pitchers' rim, aided in at least one species by a narcotic drug lacing the nectar, causes insects to fall inside, where they die and are digested by the plant as a nutrient source. Cephalotusor the Albany pitcher plant is very rare and only found in one small corner of Western Australia, near the town of Albany. It is a plant highly prized by carnivorous plant collectors worldwide. The nursery I use for my photo workshops has a small collection and has been particularly successful in cultivating it.